Closest monthly competition yet, the Bully Busters won by 0.62 points! Dam wish I had thought of that! Get ready to post next month's trophy with Boozer pics though. 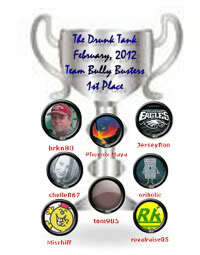 Because it was her idea, I think she should have the honor of having the first Drunk Tank Trophy on display. But perhaps she will consent to help make this a new tradition for the winners. Another exciting race to the finish this month!!! I would be absolutely honored to be the Drunk Tank Trophy Lady Sand! Getting a little anxious to see how the next few days pan out as we set out to play the best poker possible, in hopes of catching up with you Chasers & making it past the Boozers too! Good luck to all three teams! MORE tipsy than usual that is!! You made it to the final table!